We investigated the types of metabolism and genes involved with N and P reactions, and SOM turnover as well as their interaction was monitored in an apple orchard by metagenome sequencing. The field experiment included plots with and without a cover crop but with weed control, and two subplots with or without chemical fertilizer. The relative abundances of genes involved with N reactions (nirB, nirD, amoB, gltB, and GDH2), P reactions (phoA, pqqC, and E3.1.3.8), and plant degradation were higher in the cover cropped soil after treated with chemical fertilizer compared with the other treatments. 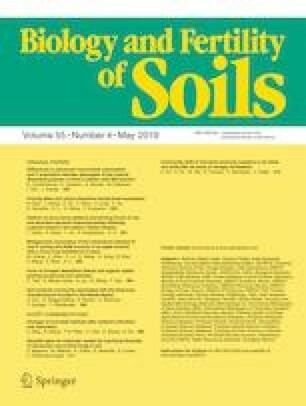 The cover crop had a greater effect on the gene network than the chemical fertilizer and it improved the number of links in the network compared with no cover crop. The betweenness centrality scores showed that the genes involved in N and P reactions were important for SOM turnover as well as for N and P reactions. Chemical fertilizer provided more available N and P for SOM turnover in the cover-cropped soil, thereby improving the soil fertility. Finally, the available N and P contents, SOM, and apple yield were increased by the application of chemical fertilizer and cropping with cover plant due to the promotion of interactions among the N and P reactions (as hypothesized by considering abundances of genes involved in both nutrient cycles), and SOM. Our results provide new insights into the interactions between N and P reactions in soil and SOM turnover from the genetic level in an apple orchard with a cover crop and when subjected to chemical fertilization. The online version of this article ( https://doi.org/10.1007/s00374-019-01356-9) contains supplementary material, which is available to authorized users. This study was supported by the Special Fund for Agro-scientific Research in the Public Interest of China (201303104), Agriculture Science Technology Achievement Transformation Fund of Shaanxi (NYKJ-2015-17), the Project of Promoting Agricultural Science and Technology Demonstration of Yangling (2015-TS-18), and the Scientific and Technological Achievements Promotion Project of Northwest A & F University (TGZX2014-16).